Interview Guests Directory - Find Guests for Podcasts, Radio, Articles, PR, and Press Interviews - Upgrade to become a "Guest Star"! Upgrade to become a "Guest Star"! Want to "Guest Star" in lots of interviews? Upgrade your expert profile to join our Guest Stars category! The "Guest Stars" category is featured on our home page and highlighted in all our emails. It's the first place that busy radio show hosts, bookers, bloggers, and reporters who use our service look to find new guests to interview. * Get your expert profile included in every monthly edition of our Special Edition "New Guest Stars" email newsletter blasts. 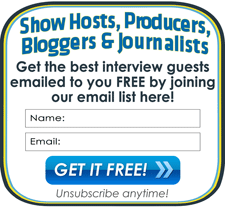 These go out monthly to our exclusive email list of radio producers, podcast hosts, journalists, and bloggers to keep your profile attracting more interviews! This is an easy and affordable way to get a lot more publicity for only $6/month!